St. Peter's baldachin, by Bernini, in the modern St. Peter's Basilica. Saint Peter's tomb lies directly below this structure. Saint Peter's tomb is a site under St. Peter's Basilica that includes several graves and a structure said by Vatican authorities to have been built to memorialize the location of Saint Peter's grave. St. Peter's tomb is near the west end of a complex of mausoleums that date between about AD 130 and AD 300. The complex was partially torn down and filled with earth to provide a foundation for the building of the first St. Peter's Basilica during the reign of Constantine I in about AD 330. Though many bones have been found at the site of the 2nd-century shrine, as the result of two campaigns of archaeological excavation, Pope Pius XII stated in December 1950 that none could be confirmed to be Saint Peter's with absolute certainty. Following the discovery of bones that had been transferred from a second tomb under the monument, on June 26, 1968, Pope Paul VI claimed that the relics of Saint Peter had been identified in a manner considered convincing. The grave claimed by the Church to be that of Saint Peter lies at the foot of the aedicula beneath the floor. The remains of four individuals and several farm animals were found in this grave. In 1953, after the initial archeological efforts had been completed, another set of bones were found that were said to have been removed without the archeologists' knowledge from a niche (loculus) in the north side of a wall (the graffiti wall) that abuts the red wall on the right of the aedicula. Subsequent testing indicated that these were the bones of a 60-70-year-old man. 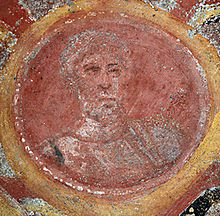 Margherita Guarducci argued that these were the remains of Saint Peter and that they had been moved into a niche in the graffiti wall from the grave under the aedicula "at the time of Constantine, after the peace of the church" (313). Antonio Ferrua, the archaeologist who headed the excavation that uncovered what is known as Saint Peter's Tomb, said that he wasn't convinced that the bones that were found were those of Saint Peter. The upper image shows the area of the lower floor of St. Peter's Basilica that lies above the site of Saint Peter's tomb. A portion of the aedicula that was part of Peter's tomb rose above level of this floor and was made into the Niche of the Pallium which can be seen in the center of the image. The earliest reference to Saint Peter's death is in a letter of Clement, bishop of Rome, to the Corinthians (1 Clement, a.k.a. Letter to the Corinthians, written c. 96 AD). The historian Eusebius, a contemporary of Constantine, wrote that Peter "came to Rome, and was crucified with his head downwards," attributing this information to the much earlier theologian Origen, who died c. 254 AD. St. Peter's martyrdom is traditionally depicted in religious iconography as crucifixion with his head pointed downward. Peter's place and manner of death are also mentioned by Tertullian (c. 160–220) in Scorpiace, where the death is said to take place during the Christian persecutions by Nero. Tacitus (56–117) describes the persecution of Christians in his Annals, though he does not specifically mention Peter. "They were torn by dogs and perished, or were nailed to crosses, or were doomed to the flames and burnt." Furthermore, Tertullian says these events took place in the imperial gardens near the Circus of Nero. No other area would have been available for public persecutions after the Great Fire of Rome destroyed the Circus Maximus and most of the rest of the city in the year 64 AD. This account is supported by other sources. In The Passion of Peter and Paul, dating to the fifth century, the crucifixion of Peter is recounted. While the stories themselves are apocryphal, they were based on earlier material, helpful for topographical reasons. It reads, "Holy men ... took down his body secretly and put it under the terebinth tree near the Naumachia, in the place which is called the Vatican." The place called Naumachia would be an artificial lake within the Circus of Nero where naval battles were reenacted for an audience. The place called Vatican was at the time a hill next to the complex and also next to the Tiber River, featuring a cemetery of both Christian and pagan tombs. Dionysius of Corinth mentions the burial place of Peter as Rome when he wrote to the Church of Rome in the time of the Pope Soter (died 174), thanking the Romans for their financial help. "You have thus by such an admonition bound together the planting of Peter and of Paul at Rome and Corinth. For both of them planted and likewise taught us in our Corinth. And they taught together in like manner in Italy, and suffered martyrdom at the same time." Fourth century glass mosaic of Saint Peter, located at the Catacombs of Saint Thecla. The Book of Popes mentions that Pope Anacletus built a "sepulchral monument" over the underground tomb of Saint Peter shortly after his death. This was a small chamber or oratory over the tomb, where three or four persons could kneel and pray over the grave. The pagan Roman Emperor, Julian the Apostate, mentions in 363 A.D. in his work Three Books Against the Galileans that the tomb of Saint Peter was a place of worship, albeit secretly. There is evidence of the existence of the tomb (trophoea, i.e., trophies, as signs or memorials of victory) at the beginning of the 3rd century, in the words of the presbyter Caius refuting the Montanist traditions of a certain Proclus: "But I can show the trophies of the Apostles. For if you will go to the Vatican, or to the Ostian way, you will find the trophies of those who laid the foundations of this church." These tombs were the objects of pilgrimage during the ages of persecution, and it will be found recorded in certain Acts of the Martyrs that they were seized while praying at the tombs of the Apostles. During the reign of the Roman Emperor Valerian, Christian persecution was particularly severe. The remains of the dead, and particularly the Christian dead, had lost their usual protections under Roman law. The remains of Peter and Paul may have been removed temporarily from their original tombs in order to preserve them from desecration by the Romans. They may have been removed secretly by night and hidden in the Catacombs of S. Sebastiano in 258 AD, being returned to their original tombs in 260 when Valerian's reign ended. When the Church was once more at peace under Constantine the Great, Christians were able at last to build edifices suitable for the celebration of Mass. The resting places of the relics of the Apostles were naturally among the first to be selected as the sites of great basilicas. The emperor supplied funds for these buildings. Between 320 and 327, Constantine built a five-aisled basilica atop the early Christian necropolis that was purported to be Peter's resting place. Much of the Vatican Hill was leveled to provide a firm foundation for the first St. Peter's Basilica. The altar of the Basilica was planned to be located directly over the tomb. The matter was complicated by the upper chamber or memoria above the vault. This upper chamber had become endeared to the Romans during the ages of persecution, and they were unwilling that it should be destroyed. The memoria was turned into the Chapel of the Confession. Above that was the main floor of the Basilica, with the raised altar directly over the Chapel of the Confession. The Book of Popes details certain adornments that Constantine apparently added to Saint Peter's tomb at this time. The sarcophagus itself is said to have been enclosed on all sides with bronze, measuring 5 feet in each dimension. On top of that was laid a gold cross weighing 150 pounds and featuring an inscription, which translates from Latin as "Constantine Augustus and Helena Augusta This House Shining with Like Royal Splendor a Court Surrounds." However, any treasures that may have been present at the tomb are presumed to have been taken by the Saracens during their Sack of the church in 846. 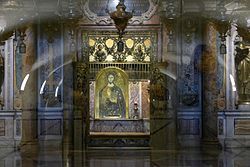 The skull of Saint Peter is claimed to reside in the Basilica of St. John Lateran since at least the ninth century, alongside the skull of Saint Paul. A tomb had been discovered at the beginning of the 16th century, when the foundations were being laid for the four twisted columns of Gian Lorenzo Bernini's "Confessio". Construction of Constantine's Old St. Peter's Basilica and of foundations for Bernini's Baldacchino destroyed most of the vaulting of these semi-subterranean burial chambers. Among them was the so-called "Tomb of the Julii" with mosaics that appeared to be Christian. Between 1939 and 1949, the Vatican-led archaeological team overseen by Monsignor Ludwig Kaas, who had overall authority over the project, had uncovered a complex of pagan mausoleums under the foundations of St. Peter's Basilica (the so-called Vatican Necropolis), dating to the 2nd and 3rd centuries. No mausoleum had ever been built directly beneath the present high altar of St Peter's, which did however contain shallow burials, one dated by an impressed tile to the reign of Vespasian; subsequently they had been attended with care, as later burials clustered round but did not encroach upon the space. There was a small niched monument built into a wall ca. 160. The discoveries made the pages of Life magazine. In 1942, the Administrator of St. Peter's, Monsignor Ludwig Kaas, found remains in a second tomb in the monument. Being concerned that these presumed relics of a saint would not be accorded the respect they deserved, and having little understanding of correct archeological procedures, he secretly ordered these remains stored elsewhere for safe-keeping. After Kaas's death, Professor Margherita Guarducci discovered these relics by chance. She informed Pope Paul VI of her belief that these remains were those of Saint Peter. Bone testing revealed that the remains belonged to a man in his sixties. On June 26, 1968, Pope Paul VI announced that the relics of Saint Peter had been discovered. On November 24, 2013, these relics were held by Pope Francis and displayed publicly for the first time after celebrating closing 'Year of Faith' Mass. In 1953, two Franciscan friars discovered hundreds of 1st century ossuaries stored in a cave on the Mount of Olives near Jerusalem. The archaeologists claimed to have discovered the earliest physical evidence of a Christian community in Jerusalem, including some very familiar Biblical names. The name inscribed on one ossuary has been interpreted to read: "Shimon Bar Yonah" - Simon, the Son of Jonah. However, several scholars, both Protestant and Catholic, disputed that the tomb belonged to Peter, one of the reasons being that there was no inscription referring to him as "Cefa" or "Peter". Dr. Stephen Pfann of the University of the Holy Land reads the inscription as "Shimon Barzillai"; the Barzillai being a famous family in Jerusalem. The 43 inscriptions discovered in the Dominus Flevit cemetery between May 1953 and June 1955 were published with photographs by P. B. Bagatti and J. T. Milik in 1958. Very little is known about the burial of Peter's immediate successors, prior to the period when popes are known with relative certainty to have been buried in the various Catacombs of Rome. Burial near Peter, on Vatican Hill, is attributed to: Pope Linus, Pope Anacletus, Pope Evaristus, Pope Telesphorus, Pope Hyginus, Pope Pius I, Pope Anicetus (later transferred to the Catacomb of Callixtus), Pope Victor I. Epigraphic evidence exists only for Linus, with the discovery of a burial slab marked "Linus" in 1615; however, the slab is broken such that it could have once read "Aquilinius" or "Anullinus". With three exceptions, each pope prior to Anicetus, the first pope known to have been entombed in the Catacombs, is traditionally regarded as having been buried near Peter. A notable exception is Pope Clement I, who was traditionally regarded as having been martyred in the Black Sea near Crimea. Similarly, the original tombs of Pope Alexander I and Pope Sixtus I are unknown, although there are several churches positing mutually contradictory claims of translation. Two books were written about the tomb and bones of St. Peter: "The Bones of St Peter" by John Evangelist Walsh and "The Fisherman's Tomb" by John O'Neill. In April 2017, CNN'S Finding Jesus Faith Fact Forgery show featured the story of St. Peter's bones and tomb in its 5th episode from season 2. ^ Guarducci, Margherita. "THE TOMB OF ST. PETER". Hawthorn Books. Archived from the original on April 29, 2009. Retrieved 2009-05-27. ^ Roger T. O'Callaghan, Roger ., "Vatican Excavations and the Tomb of Peter", The Biblical Archaeologist 16.4 (December 1953) p.71. Of the coins found with the bones, in a hollow beneath the niche of the earliest shrine on the site "one was of the Emperor Antoninus Pius (138-161), six were from the years 168-185, and more than forty were from the years 285-325,". ^ Guarducci, Margherita. "The Remains of Peter". Archived from the original on May 7, 2009. Retrieved 2009-05-28. ^ "Antonio Ferrua, 102; Archeologist Credited as Finding St. Peter's Tomb". Los Angeles Times. Retrieved 2012-02-13. ^ Webb, Matilda (2001). The churches and catacombs of early Christian Rome: a comprehensive guide. Sussex Academic Press. p. 17. ISBN 1-902210-57-3. Retrieved 2012-02-18. ^ Cornelius Tacitus (1895). Annals of Tacitus. Macmillan and Co.
^ a b Schaff, Philip (1904). A select library of Nicene and post-Nicene fathers of the Christian church. The Christian literature company. .
^ a b The book of the popes (Liber pontificalis). Columbia University Press. 1916. ^ Julian (Emperor of Rome) (2004). Julian's against the Galileans. Prometheus Books. ^ a b c One or more of the preceding sentences incorporates text from a publication now in the public domain: Barnes, Arthur (1912). "Tomb of St. Peter". In Herbermann, Charles. Catholic Encyclopedia. 13. New York: Robert Appleton. Retrieved 19 January 2015. ^ Lanciani, Rodolfo Amedeo (1899). The destruction of ancient Rome. Macmillan company. ^ Cuming, H. Syer (December 1870). "Notes on a group of reliquaries". Journal of the British Archaeological Association. ^ Officially published as Esplorazioni sotto la Confessione de San Pietro in Vaticano, B.M. Apollonj,, A. Ferrua SJ, E. Josi, E. Kirschbaum SJ, eds., 2 vols. (Vatican City) 1951; the results were assessed in Roger T. O'Callaghan, "Recent Excavations underneath the Vatican Crypts", in The Biblical Archaeologist 12 (1949:1-23) and "Vatican Excavations and the Tomb of Peter", The Biblical Archaeologist 16.4 (December 1953:70-87). ^ This is the "open area P'. (O'Callaghan 1953:76). ^ P. B. Bagatti, J. T. Milik, Gli Scavi del "Dominus Flevit" - Parte I - La necropoli del periodo romano (Gerusalemme: Tipografia dei PP. Francescani, 1958). ^ a b c d Reardon, Wendy J. (2004). The Deaths of the Popes. Macfarland & Company, Inc. ISBN 0-7864-1527-4. Walsh, John E. (2011) . The Bones of St. Peter. Sophia Institute Press. ISBN 978-1933184753. This page was last edited on 27 March 2019, at 18:17 (UTC).